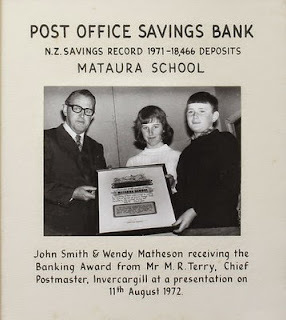 On leaving home I put money into a home ownership account with the Southland Building Society and after ten years it matured into sum that enabled me to pay the deposit on my first house. In 1987, as a young teacher of seven years experience, I was able to make an important property investment. My $5,000 deposit was able to purchase a house with the same value as my annual salary ($27,000), a tidy three bedroom wooden bungalow in a good area (admittedly in Invercargill). My financial future at that point was relatively secure, I had reasonable certainty of income and had a capital asset that would retain or grow in value. My son has had different experiences from me financially and has a much more uncertain future. While we encouraged both our children to save money in their own accounts, banking in schools was no longer supported. Bank fees were also excessive for accounts holding small sums and returns were minimal. It seemed to make more sense to spend money rather than have it lose value in the bank. Despite putting money aside in an education savings scheme to help pay for my son's tertiary education, and he was able to earn money through holiday employment, a student loan was inevitable (and encouraged). My son, with the support of his parents, has managed to limit the size of his loan to well less than the average, but it is still a substantial amount that needs to be paid back. Depending on the qualification, student loans of $40-100,000 are common. Having just completed a useful degree (Design Innovation) my son has no guarantee of employment where his skills can be fully utilized and we have a country where graduates earn less than most in the OECD. After five years, if my son is able to find a job related to his qualification, he can expect to be earning around $50-60,000 a year at age 27. Rather than saving money for a deposit on a house with his initial earnings my son will still be trying to pay off his student loan. Even if he was in a position at that age to buy a house similar to my first one (in the same area of Invercargill) he would be looking at a house worth around $160,000 (around three times his annual salary) and will be needing a $24,000 deposit. The cost of housing in relation to income has increased at least three times since I bought my first one. By the time my son has paid off his student loan and has saved enough for a deposit on a house he will likely be in his mid thirties. By that stage I was living in my third house, which is our current home, and was concentrating on bringing up a young family. Most young New Zealanders looking to buy their first house do not live in Invercargill and $250,000 to $300,000 would be the cheapest price range for the majority of areas where our population is concentrated, five to six times the annual salary my son will be potentially earning. We now have a future generation where house ownership is practically an impossible dream. Removing the Government kickstart for Kiwisaver is effectively knocking out yet another support that once made home ownership possible. When the cost of financing superannuation and supporting our elderly is approaching $800,000 extra each year, there is a widening divide between the wealth and welfare of our retirees and our youth. For a country with a strong economy, rich in resources and a relatively small population, surely there should be some expectation of home ownership and financial security for following generations. It appears we are already exploiting and borrowing from my son's future to support today's inequitable and unsustainable economy. The concept of investing in our future appears to have disappeared with school banking, our children must do the best they can with what little we leave them. Our own life story is very much like your one, right down to working in the same profession. Our three children are all university educated, a scientist, software engineer and teacher. Like your son they face the same problems. Thankfully all no longer have student loans, but two of the three are now living and working overseas, with little likelihood of returning here. We as also living overseas following the closure of Christchurch schools post earthquake. For struggling young people the grass not only appears greener on the other side but actually is so our talented young people leave for a more secure life financially overseas. Not what we need for the future of this country either. What do you make of the latest poll Dave? Seems National's story-telling abilities are keeping them incredibly popular, despite the Auckland housing crisis (there is no crisis), the assault on a waitress by the Prime Minister (just horsin' around) and the rest of it. What has happened to New Zealanders? Are we hypnotised or something? "Richard Harman concluded his presentation to the recent Fabian “Destination Next Progressive Majority” event by quoting the noted political scientist Bob Chapman’s remark that he had “reluctantly come to the conclusion that it was far more important for a political party to have a communication strategy than an economic policy.” I’m inclined to agree." Avoid abstract ideas – appeal to the emotions. Constantly repeat just a few ideas. Use stereotyped phrases. Give only one side of the argument. Pick out one special “enemy” for special vilification. NZ's Social Democracy Leadership Ends.